from "bhamsandwich's photostream" on flickr. It goes without saying that the Kentucky Derby and horses go together like and honey and bees. But some might say that the Derby and mint juleps have just as sure a relationship. Although I’m descended from some Kentuckians, I’ve never tried the beverage. But I’m looking forward to sampling one or two on Saturday at the annual gala for the Rhinebeck Science Foundation. The mint julep is said to have originated in the South in the 1700s and has been the official drink of the Derby since 1938. Although most of what is served at the event itself is Early Times Mint Julep Ready-to-Serve Cocktail (to the tune of 8,000 liters), much better versions are made at Derby parties everywhere, although mixers disagree on how sweet it should be, and just how minty, whether the herb should be abundant and muddled (bruised) or merely a sprig to garnish the drink while teasing the nose with its subtlety. 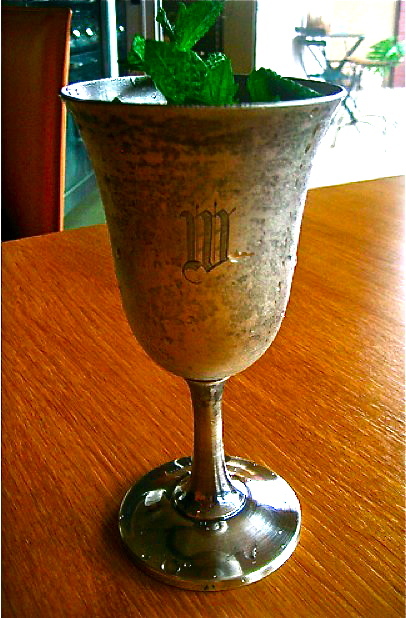 James Villas, author of My Mother’s Southern Kitchen (Macmillan, 1994) and most recently Pig: King of the Southern Table (Wiley, 2010), describes in the former volume a collection of eight silver monogrammed julep cups given to him by his sister over eight consecutive birthdays. He says each drink must be made separately; the mint julep is decidedly not something you can mix up in a vat. He calls for shaved ice, never chunks, and for Jack Daniels Sour Mash as the bourbon of choice. In spite of Watterson, the combination of bourbon, mint and sweetness is a classic one, a flavor combo that works beautifully in a pecan pie as well. Pecan pie is my favorite decadent southern dessert and adding a bit of bourbon makes it even naughtier. If you like, substitute a different crust of your choosing or even a pre-fab single crust. Makes 1 9” pie. 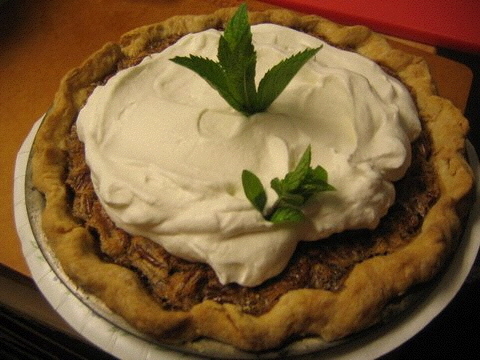 Bourbon Pecan Pie with Julep Whipped Cream. Photo by Jessica Bard. For pie crust: Blend butter and shortening and chill until firm. In a medium bowl, mix flour, salt, and sugar. Add the chilled shortening/butter mixture in pieces and work quickly with your fingers until lumps shrink to pea size. Add just enough water to make the mixture hold together; it will still be somewhat crumbly. Pat it together to make a flattish disk, wrap in plastic wrap or wax paper and chill for half an hour. Preheat oven to 350˚ F. Roll out dough on a floured flat surface (cutting board, marble slab or dishtowel-topped countertop), and lay it out into a 9-inch pie plate, pinching up the sides and crimping decoratively. For pie filling: In a medium bowl beat eggs with hand mixer until just blended. Add brown sugar, corn syrup, melted butter, 2 tablespoons of the bourbon, cornstarch, vanilla, and salt. Mix well with hand mixer or spoon until completely blended. Stir in pecans and pour filling into prepared crust. Cook for 70-80 minutes or until mostly set in middle when you give it a jiggle. Let cool on rack. Whip whipping cream with hand mixer at high speed until soft peaks form. Add sugar, remaining 2 teaspoons bourbon, mint flavoring and mix in. Spread mixture on cooled pie, leaving pecans showing around edges. Decorate with springs of fresh mint if you like. Alternatively, serve slices with hearty dollops of the julep whipped cream on top, or skip the whipped cream and serve the pie with mint chocolate chip ice cream.